A trillion-tonne iceberg, one of the biggest on record, has snapped off the West Antarctic ice shelf, according to scientists who have monitored the growing crack for months. 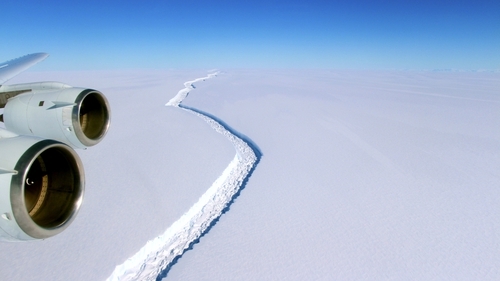 "The calving occurred sometime between Monday, July 10 and Wednesday, July 12, when a 5,800-square kilometre (2,200-square mile) section of Larsen C (ice shelf) finally broke away," Swansea University said in a statement. Earlier, this month scientists said a chunk of ice was hanging by a thread and was expected to calve within months. At that time, a 6,600 square kilometre section was expected to break off, according to the European Space Agency, which would be comfortably bigger than Galway, which measures 6,149 square kilometres. The 5,800-square kilometre section that has broken off is a little smaller, but is still bigger than Ireland's third biggest county, Mayo, which comes in at 5,586 square kilometres. It is expected the massive iceberg will flow in water and by itself will not add to sea levels when it melts. The real danger is from inland glaciers. If the glaciers held in check by Larsen C spilt into the Antarctic Ocean, it would lift the global water mark by about 10cm, researchers have said.